I believe it has much ado about how I make the statement. I do it with a mischievous glimmer in my eyes, masked ever so slightly by my version of a dexterous detached attitude that makes it possible to embrace the label: “motla-a-pepiloe”, a child begotten on her mother’s back into marriage 2. This attitude is by no means unfriendly to deter people from probing me with questions. I merely suspect that people choose not to ask because they assume they know what it is I am alluding to, even though this may just be one side of the story. This said, let me assure you that there is another side to my declaration, which, in my opinion, truly roots my identity (especially as a proud feminist who is mindful of the power of choice that comes with adulthood). This side pertains to a piece of history where a woman married a man in order to carry her family name forward. Specifically as it applies to my choices as an adult, it is about choosing to identify with a piece of matriarchical history that some would prefer to ignore or phrase in a manner that eliminates a woman totally from the picture. Ntate Ramakhula in his article about the “genealogy of Bataung” 3 makes mention of this history. I must say, seeing it in black and white almost made me fall off a chair with glee. However, I was slightly disappointed by failure to once again acquire the name of a woman that history wants to forget; I don’t mean her alias ‘Mamolete, which references her by the son she bore. Tebele did not bear a male heir, but tried to enforce his daughter’s son to be his heir and the head of Bataung. Contrary to the custom, he married a son in law for his daughter into his family and their progeny was thus declared, but, his subjects nullified the declaration, hence, Molete, the son from his marriage was denied the seniority. […] If gender issue had not been negative, the Bataung ba Ha Molete would have been the most senior. As I grow from being a mere seed to a very promising seedling, I realise that the journey to becoming a strong tree is not an easy one! It is not just because we are facing global warming and there is not much rain. It is because some people are ready to cut me down – perhaps for firewood or just because they can. Is this really how it is supposed to be? Why can’t people see that all I want is to grow into a beautiful tree that bears good fruits. A tree that provides people with a shade on a hot day. And a tree with strong branches to allow birds to build their own nests and find shelter in this drought stricken world. This is all I want, but instead of being still and trusting that I shall be that tree, I feel like an angered lion. So like a lion, I shall roar to take out this anger that lies inside me. I shall roar to fight the injustices of this world. And I shall no longer aspire to be the tree for I cannot just be silenced; I shall be the roaring lion! Although Lesotho is a one tribe nation, Basotho are divided into several clans. Each clan has an animal totem that not only guides it but in many respects defines the qualities/characters of members of that clan. Understanding these clans allows not only to celebrate the diversity of the nation and its individuals but provides a basis of respecting people for who they are and how they can contribute in the community. In my previous posting, I made a reference to the Batlokoa clan, so I will start my discussion with them and then will proceed to discuss a few others. Batlokoa venerate the wild cat. As I was once told, Batlokoa unlike any other clan reflect so much the animal they venerate. If they are geared for an attack there is no stopping them! They would for example not hesitate to knock down a wall if at all they feel using the door might delay them. For the record, although some thought Sekonyela was contemptuous he had a valid point; but this shall be explained shortly under the Bafokeng. The point is Batlokoa are fearless, ruthless and once they have decided you are not worthy of their respect embrace yourself for a good fight for that is as certain as death is to a person. I am a Motaung (see my about page) so expect a slight bias! The Bataung or rather the lions and lionesses are very gracefully by the mere fact of knowing that they are the true kings and queens of the jungle. As far as history is concerned, no great war that Moshoeshoe fought was without the Bataung in the lead. Although I cannot think of a book that can be used as a reference, I assure all that on many occasions Moshoeshoe had to wait for the Bataung men under chief Moletsane before attacking. This is because Bataung are not just good wariors they are excellent military strategists as well. This protocol was the one that Sekonyela wanted Moshoeshoe to observe. However, because Bafokeng in some sense relinguished their power to Moshoeshoe, the interpretation was that Moshoeshoe was a proxy for them. As such, he was holding power for a clan that ranked higher than the Batlokoa. As a side note, Moshoeshoe was a nephew to the Bafokeng. His maternal uncle Makakane (not sure about his name so I stand to be corrected) played a pivotal role in the transfer of powers. 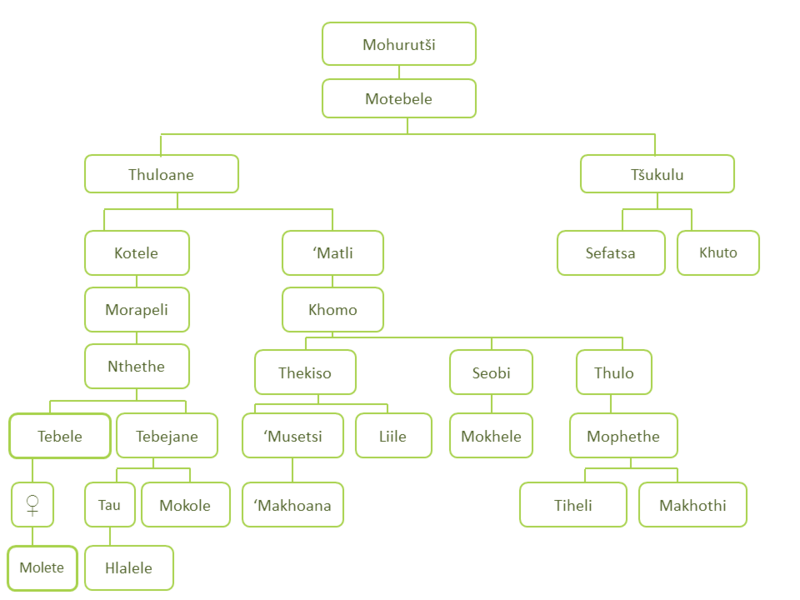 I haven’t really found text to support this but understanding the role of malome (maternal uncle) in Basotho traditions, I have no doubt that the uncle played a pivotal role :D. Another side note, Moshoeshoe ensured that his most senior wives came from the Bafokeng clan so I believe this helped to legitimise his powers. This is based on my believe that behind every great man is a smart woman. ‘Mosali o ts’oara thipa ka bohaleng’. Bakuena venerate the crocodile. They are generally regarded to make best business men and politicians. Anybody understanding the link between these two professions indeed should understand the character of Bakuena. To those who might need a hint, let me put it this way, not all deals should be taken as personal, the deals are simply made with the greater good in mind! Moshoeshoe the founder of the Basotho nation was a Mokuena. When I do get around to writing all I know about him please just bear this in mind. Basia venerate the cat. They are proud, confident and although tame, they are not easily subdued. If you have ever heard of the expression: “you don’t own a cat; a cat owns you!” then you can possibly understand why Basia are not subdued. Another thing about Basia is that they can be self centered. I suppose the tendency to put SELF first might also have to do with the fact that they own and are not owned. The animal totem for the Bats’oeneng is the monkey. One word comes to mind when it comes to the description of the Bats’oeneng and this is “masene” – ingenious. Sometimes their ingenious is as defined by the expression: “monkey see, monkey do” ! This being the case, one has to remember that looks can be deceiving. Furthermore, that the ability to act doesn’t mean the “action” has been thought through! Makholokoe are amiable and good-natured people. They venerate the domestic fowl (aka chicken). If you like, you may interpret their cautious behaviour as chicken-like but this doesn’t mean they can’t defend themselves: for they can! They simply may not be able to do so with the finesse of good warriors. Occasionally, I aim to please: so I have finally decided to create a wiki of sort that includes a limited listing of praise songs of Basotho clans. If you can't see the wiki, you can also click here to access it. To all who inspired the creation of this wiki, thank you so much for taking time to interact. I realise at some point I lost the courtesy to even acknowledge your comment postings. I apologise and hope at the very least you find your answers in the wiki, which is and will continue to be work in progress. Yesterday, I went to see Umrhube (indigenous music) performance featured in the Grahamstown’ annual arts festival. The performance was great! However, the patriot in me thinks Basotho are better. This of course is debatable but is absolutely besides the point. The point I wish to make is that the perfomance invoked thoughts of what ‘indigenous’ means and how much of what can be regarded as indigenous information an/or knowledge is documented. I am not really sure of the answer but since I appreciate that most of this information is passed on from one generation to the next orally, I thought it would be worthwhile to challenge myself by embarking on a journey that takes me to the roots of my origins. I will begin this journey by using Umrhube’ performance. The group dressed in colourful attire and each member dressed according to their own individual style and taste. The women in particular although danced standing reminded me of the Batlokoa women. Other than the dancing, the performance made me think of the role of music in general to culture. To me, it seems that we sing through it all. We sing when we are happy, sad, uncertain, bored, etc. So indeed music might be the food of the soul and through music we might just return to our roots.